Properties in City of Winchester average 4.5 out of 5 stars. Property 5: The Down House Cottage less than 3 miles from the heart of historic Winchester. Property 10: The Potting Shed - a gorgeous, characterful bolthole in Winchester's old town. Property 47: Tranquil Cottage in this Quiet Corner of The New Forest. It's a secret! All the benefits of The New Forest but much more relaxed and laid back. This was our second stay at Owls Lodge and when we arrived at this lovely holiday cottage we knew why we had come to stay again. 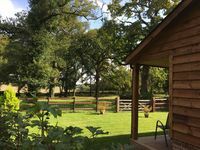 It&rsquo;s so peaceful and relaxing with picturesque views into the wood and the surrounding countryside.The lodge although situated in the grounds of the owners property is completely detached and has it&rsquo;s own private garden, it really does feel like a cottage in the wood miles away from all the hustle and bustle. The New Forest is within easy reach from the Lodge but the area immediately surrounding the Lodge has plenty to offer, there are plenty of walks straight from the garden gate too, beautiful Bentley Woods, which dates back to early Saxon times is our favorite walk. A visit to Broughton Common Nature Reserve is a rewarding walk too.The Lodge is kept very clean and provides a comfortable getaway with ample of space for two people. We love everything about Owls Lodge and as the name suggests, you really do hear the tuwit tuwoo of the Owls that lodge there, right outside the bedroom window!